Projection was originally coined by psychoanalyst, Sigmund Freud, as a state in which a person defends himself against his own unconscious impulses, emotions, or beliefs by denying their existence in themselves while attributing those qualities to a significant other/family member/person. 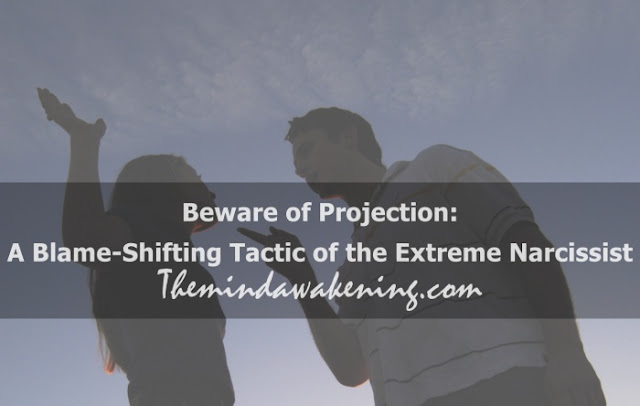 In the survivor community, projection is also called "Blame-Shifting." In other words, the narcissist may have certain feelings buried or repressed within themselves but because they are so cut off from being introspective and having the ability to generate insight about their emotions, often a narcissist will essentially verbally vomit up (or project) their feelings onto their love object. (Yes, the image of projectile vomiting applies here). Often this blame-shifting happens when a narcissist has experienced a narcissistic injury or a boundary was set by their partner, thereby resulting in the narcissist feeling a sense of loss of control/power. For example, Sally responded to Jeff's flirtatious texts. Jeff made it clear he was looking forward to meeting up with Sally when he was in town on a business trip and looked forward to rekindling their romance. Sally responded to Jeff's "hoover" with some trepidation. She remembered prior cycles of idealize/devalue/discard with Jeff. It had been so long though, so she felt she should give him the benefit of the doubt and see if he had changed in a mature fashion. So Sally set a clear healthy boundary with Jeff that she would only visit with him on the condition that he show sustained ability to be honest. Seems like a normal enough request. However, to the extreme narcissist, a healthy boundary or limit incites a narcissistic injury, or major blow to their fragile ego. Fortunately, Sally would later learn that she dodged a bullet with an extreme narcissist. When Sally responded to Jeff's flirtation and expressed interest in seeing him, Jeff abruptly responded with anger and disgust that Sally would want to re-engage on a romantic level. Out of the blue, Jeff projected his repressed and buried feelings onto Sally. "You can't get over me. I am not that into you. I am only interested in friendship. Why are you reading into things? You obviously have feelings for me." Sally was stunned. Jeff was not only denying his feelings for her but projecting his repressed emotion onto her, blame-shifting. Jeff, as an extreme narcissist, could not handle feeling close emotionally to someone he was attracted to and instead felt his alarm bells going off. So he engaged in seductive-withholding behavior to protect himself from getting hurt. Basically everything he projected onto Sally was really how Jeff was feeling on a deep level. He just could not own his feelings on an authentic, honest level. A healthy, mature individual who is capable of true intimacy would banter back and forth in flirtation and follow-up with actions of integrity and authenticity, confirming and validating their attraction to their significant other, gradually and slowly building trust. An extreme narcissist is terrified of vulnerability and losing control. Expressing one's most intimate feelings for someone is too revealing for an extreme narcissist to consciously own and express, so s/he becomes highly defended and projects their subconscious feelings onto their partner. So what is Sally to do? Unfortunately, Jeff is not just an individual with narcissistic "traits" that might be worked through with some intensive therapy. He is much further on the spectrum of narcissism and is cut off from his own feelings and incapable of authentically owning his repressed emotions. Sadly, Jeff has pretty significant limitations with what he can offer Sally. She is better off cutting her losses and moving on to date someone who can reciprocate the mature love she is capable of expressing and maintaining.